This is a slightly scary question, as there is not one correct answer. This varies from person to person, and is extremely personal. I do believe, however, that the interviewee should have a prepared, coherent answer to this question. It would look bad to stumble for an answer if you were asked this. In order to answer this, you would at least have to be familiar with the district. Knowing the contextual factors of the district would be a necessity in order to answer this question. While not technically a question, I could foresee this being one of the first things the interviewer says. It is a little daunting, because I would not want to give too much information for fear of boring them. On the other hand, I would not want to be too short, and not give the interviewer all of the information they desire. This is another question that has multiple acceptable answers. This questions worries me because I would not want to give an answer they hear all the time. How could I sound unique without overdoing it? Lexipedia is a visual thesaurus. 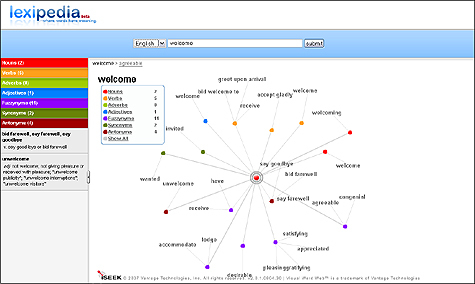 The user can type in any word in the search bar, and the website generates words that correlate to the word that was searched. It provides the definition of the word that was searched, and the definitions and part of speech of all the words that correlate to it. It is visually appealing and easy for students to navigate. Free Rice is a website that quizzes the user on vocabulary. Instead of providing definitions as options, it provides synonyms for words. For every questions you get correct on this site, the website donates 10 grains of rice through the World Food Programme to help end hunger. The more questions you get correct, the more difficult the questions become. The more questions you get wrong, the easier the questions become. The adaptability of the website is useful for students because it will be in their range of knowledge. Wordle creates a word cloud based on text that the student can copy and paste into a box on the website. The more often a word appears in a text, the larger the word is in the word cloud. The is a visual representation of the vocabulary and the frequency of the vocabulary used. Students should not totally rely on it as a guide, but I believe it would be useful for students who are stuck and do not know which vocabulary words are most prominent in a text. Write About is a website that enables students to receive feedback on their work in an organized manner. It also helps students explore different genres by practicing them digitally. Feedback is important for students so they know what they are doing well and what they need to improve upon.